Does your spouse sing bad, 80’s rock in the shower? Would your life be greatly enhanced by some Star Wars tunes being sung instead? We can take care of that! 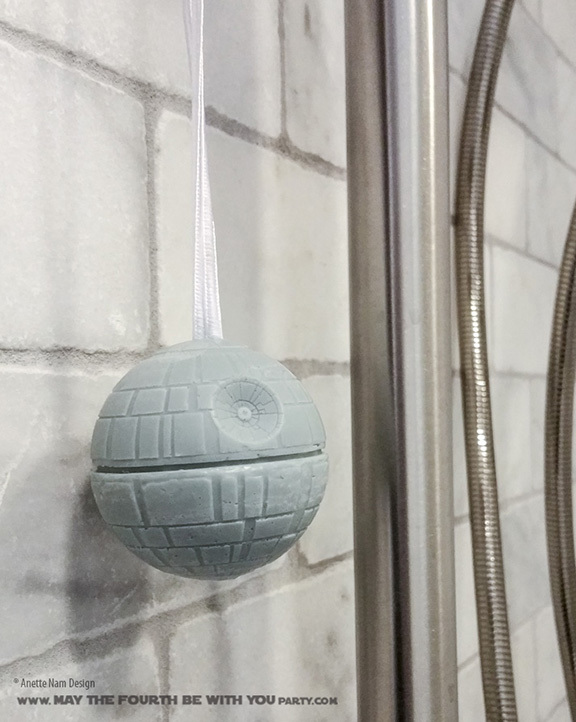 Introducing the M4P exclusive Death Star Soap-on-a-Rope! Guaranteed to leave you clean, nice-smelling and ready start every day with a smile and some serious Jedi mojo. Disclaimer: It will NOT do is help if your spouse sings out of tune. Dum dum dum, dum-de-dum. Dum-de-dum. Dum da-ra dum, da-ra tadada da dum, da-ra tadada da dum, da-ra dum, da-ra dum…. Set up your work station on a placemat or cutting board. It is so much easier than to try to get all the soap drippings off your table or counter at clean-up time. With the chopstick, carefully punch both ends of the rope through the X from the bottom. Leave about 1.5″ inside (and the loop outside). Put bottom part of the mold down – preferable on something latticed so you can thread the rope through so it sits flat. Mix 5 drops each of Red, Blue, and 7 of yellow in the small bowl. (the mixed colors should make a dark grey!) depending on your color brand you might have to change your ratio. Cut 6 oz of soap in small chunks. Microwave for about 30 secs. Stir with disposable chopstick. If not melted, microwave again 15 sec increments. Mix in coloring, a bit at a time, just in case your coloring is more “potent” than what I used. Stir. Add more if needed. Pour soap into bottom half of the mold (about 3/4). Carefully put the top of the mold on. With a steady hand, pour soap into the hole at the top of the mold. After about 4-5 hrs take the top off. Carefully cut off any parts that stick out with a sharp knife. 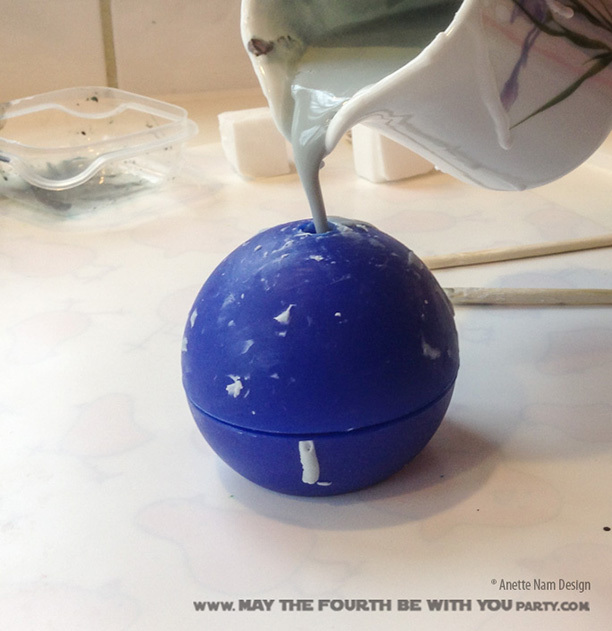 The Death Star weighs about 4.5 oz when done, but you need more than 5 oz of soap, because there is always spillage, and lots end up sticking to the container. If you make 8 oz, you will have enough for a tray of X-wing soaps too. 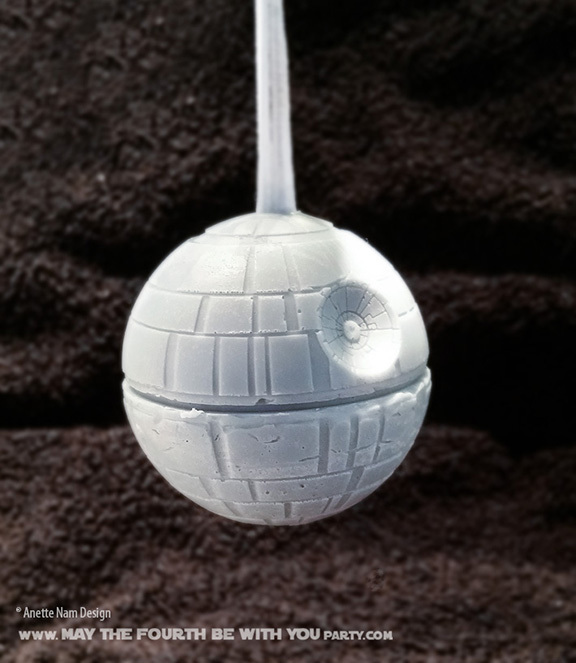 If you don’t want to cut a hole in the top of the Death Star mold (and who could blame you! ), you can use the pouring hole that is already there. You pour all the soap in through the hole, then stick the 2 ends of the chord. Keep in mind that your Death Star will hang upside down though, since the top of the mold is the bottom of the Death Star. Removing the soap from the mold is better with a 2 person team. The soap dents pretty easily, and the ridges inside the mold can easily damage the soap if you pull it straight off. Better to have one person hold the bottom section, while you bend the top off. Once you use your mold for anything other than food, you should not use it for food again.